Some days you might wonder whether cooking is worth all the effort. Sure, you can put a great meal on the table, but your kitchen can end up looking like a cyclone hit it, with a trail dirty dishes, pots and silverware. You might think to yourself – It’s going to take longer to clean up than to eat! Measure ingredients over the sink and put away each ingredient right after you’ve used it, so that the counter isn’t cluttered with packages. When making dishes like stir-fries, it’s important to get all the ingredients measured and ready before you turn on the stove. If you use a spoon or measuring cup, quickly give it a rinse or stick it in the dishwasher. It’s also not a bad idea to fill one sink halfway with warm, soapy water so you have a place to put used dishes and utensils. Wipe up spills on the counter as they happen. That keeps your counters from turning into a mess that will only be harder to clean up later. Plus, it immediately opens up counter space. 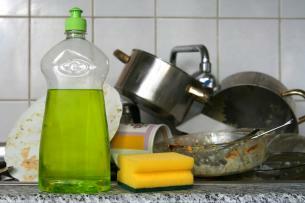 Keep a spray bottle of water mixed with dish washing liquid handy for counter spills. Store often-used ingredients and kitchenware in easy-to-reach places and clean out your kitchen cupboards and refrigerator periodically. Then there’s no need to empty an entire cabinet to find what you need. One way I cut down on mess is by using paper plates to hold ingredients as I prepare them. I might use one to hold chopped onions, for example, then just toss it once they’ve been added to the pot — so there’s nothing to wash. If I need to peel some potatoes or carrots, I do it right over the garbage pail so all the mess goes directly where it’s supposed to. Peeling shrimp? That bag that they came in is exactly where I put the shells and then out it goes without having to use an extra plate. Whenever possible, line baking pans and dishes with tin foil so that you’re not stuck scrubbing a stuck-on mess. Tin foil really helps minimize the mess when baking fish, meat or roasting vegetables. If you do end up with a stuck-on mess, soaking the pan or dish in hot, soapy water will make it much easier to clean. On days when you’re really pressed for time, stick to simple meals that don’t require a lot of pots and pans. Look for recipes where all the ingredients are cooked in one pot or dish, like soups, stews and hearty salads. Divide your work: If you’re planning a big meal with lots of courses, decide what you can do the night before. This will minimize the work and mess while you’re juggling a bunch of plates at meal time. If I’m serving a green bean casserole, for example, I’ll wash, remove the tips and halve my beans the night before. Then I leave them sitting in the fridge, until I’m ready to cook them. This makes it much easier to clean up your kitchen. If you have decorative items, a bunch of small appliances, a dish drainer and cooking utensils on your counters, there’s a lot going on! If you’ve got to lift up all that stuff to keep things clean, you’re working too hard. My rule is to have no appliances on the counter (or just one if you use it daily, like the toaster). I only take appliances out when I need them. I don’t like my utensils out in the open, collecting dust and spattered grease. Put your utensils in the drawer closest to your stove, so you have easy access. They don’t have to be on your counter, eating up valuable real estate. If you’ve got a small kitchen, resist the urge to buy a pile of kitchen gadgets. It might seem like high-powered appliances, with all kinds of bells and whistles, will save time in the kitchen. But remember that these contraptions and all their attachments have to be cleaned after each use. Click here for more tips on keeping a clean and tidy kitchen. Some useful tips. Personally I don’t like wasting resources, so instead of using paper plates, can I suggest a small strip of cling film on a plate when preparing ingredients. Great post. I always try to clean up as much as I can as I go along. For some reason it just bothers me to have tons of dirty dishes in the sink when I sit down to eat. Not to mention when you finish eating, you are much happier. Paper plates & alum. foil….yikes!! This does not seem very ‘green’ to me?? I cringed with the paper plate idea too. I made some double thickness flannel wipes for cleaning and they work GREAT for collecting potato peels, strawberry tops, etc as I’m preparing food. Then I just pick them up by the corners, take it to the trash, and drop the waste in. The wipe can then be washed with the regular towel load. If you are using a crock pot to cook. Reynolds makes crock pot liners and they are very handy and easy. Also, if I know I’m gonna make a meal that requires lots of dishes, I usually fill the sink up with hot sudsy water, so I can throw my dishes in there as I go. Another good one for saving a mess while peeling vegetables since my garbage is not in a convenient location to the sink, i put my old newspapers right in the sink and peel the vegetables then roll up the newspaper and throw it away. I use the thin plastic bags I get produce in, put one next to my cutting board, and keep putting the scraps on top of that. That way, I can just fold up the plastic bag and toss out all my scraps without a huge mess. Similar to Rachel Ray’s “garbage bowl” idea, but you don’t have to wash the bowl! Paper plates, newspapers and food scraps can be dumped in a bin for recycling rather than in the garbage. Vermiculture is indoor composting (great for those in the city) and it actually works! I started using small microfiber cloths for washing dishes instead of sponges. They really work amazing well, much better than a sponge. After cleaning the kitchen, I hang the cloth to dry and then throw it in the laundry basket. A new one every day or so seems a lot more hygienic than using that same sponge over and over until it disintegrates! Thanks for the tips but I agree with the other comments on making cleaning up more green and less wasteful.